Extreame Savings Item! 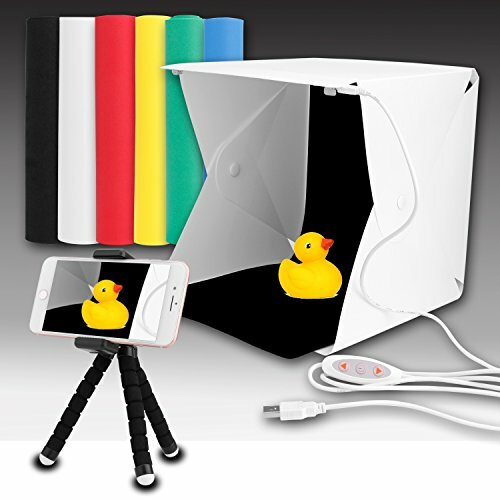 Save 43% on the Venoro Portable Photo Studio Box Folding Mini Photography Table Shooting Tent Kit with LED Light, 6 Colors Background and Adjustable Tripod Stand Phone Holder for Jewellery and Small Items by Venoro at Kmpacting Studio. MPN: H-111369. Hurry! Limited time offer. Offer valid only while supplies last. If you are seriously considering purchasing a Photography photo tent, this includes all the backdrops you will need to make your photos stand out. If you are seriously considering purchasing a Photography photo tent, this includes all the backdrops you will need to make your photos stand out. Portable design,easy to store and carry, ensures perfect shots for both amateurs and professionals. * Snap photos of your gadgets and small gifts anytime and anywhere. 40 pcs bright lED beads provide with uniform light. * Shooting with no flickering lighting, Provide continuous lighting, steady color temperature, no strobe. * Eliminate glare and spots, Softens and reflects lights for a perfect shot. * Powered via a 1.5m USB cable simply, plug and play. * Control Mode Switching: Control the light bar switch and lightness by the switch button. Light bar brightness 0-100%, you can choose the appropriate brightness according to the shooting needs. Unfold the studio by pulling from the edge, it will be easy and smooth to open. Connect three radius together with the Button inside the corner. It will be easy to get the right posistion when you feel it. Here you go, fine-tune the item, hang up the background and corner to the power supply and start your shooting now. BUILT-IN LED LIGHT - 2*40 PCS bright white LED light strips which emits soft and even lighting, prevents shadows and reflections your photos. Adopts separate switch control, you can adjust the brightness of the LED from 0% to 100% which meets your needs in different light conditions shooting items. Perfect daylight temperature for professional images. Premium Material - Small photo booth is made of hard polypropylene material with double side matte finish surface, Durable Yet Lightweight, Waterproof, Anti-flaming. Keep clean and neat by wet cloth to wipe it directly, Resist compression. Personalized Background - Black, White, Green, Red, Blue, Yellow, 6 colors background backdrops and Micro USB cable included (power bank NOT included), skid resistance with Hooks fixed, which fulfils the needs of most product photography. Portable Folding Design - Easy to carry for storage, no bigger than a piece of paper, you can assemble your own photo studio In short time, and easy to unfold this LED light box studio and place it on any surface. THE LATEST button inlaid DESIGN, more stable than traditional magnets, let your studio avoid collapsing. Wide Application - Photo Light Box Size 9.3 x 9 x 8.5 inches. Photography light box is specially designed for shutterbugs, artists and online sellers, beginners can also use it to learn to shoot professional photos. Phone tripod stand even furthers your picture taking skill by allowing to have steady aimed shots that you need for your products. Perfect for shooting small products such as toys, food, jewelry, watch and other small items. If you have any questions about this product by Venoro, contact us by completing and submitting the form below. If you are looking for a specif part number, please include it with your message.